The mouth-watering taste of Porterhouse steak will satisfy the heartiest of appetites - and the fussiest food connoisseur too! This pâté-style porterhouse steak flavoured loaf provides complete, balanced nutrition and a source of moisture that can be beneficial to small dogs. Gram-for-gram, wet foods like the CESAR® brand have fewer calories than dry food. Paired with CESAR® Dry food, the 100g serving makes a perfect meal for small dogs. 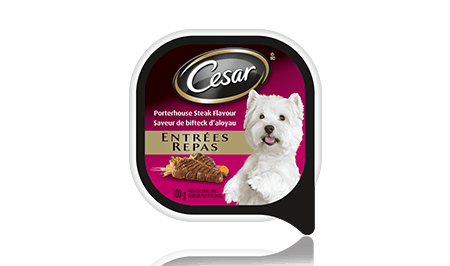 CESAR® ENTRÉES: PORTERHOUSE STEAK FLAVOUR 100g is rated 4.3 out of 5 by 41. Rated 4 out of 5 by TAMMYHON_3581177525 from My picky dog refuses to eat kibble without wet food. It's a habit I can't break her of. So I chose Cesar's because the majority of flavours are grain free and she has a grain allergy. I am always reluctant to buy wet food because you never know exactly what part of the animal is in it, truly how healthy it is or even if it is what it says it is. She ate it, enjoyed it and I would likely buy in the future. Rated 5 out of 5 by CHRISTINENMB_3581254597 from I did a test. I put two kinds of wet dog food in two different dishes for my dog. She smelled both dog foods. She only ate the Cesar Entrees Porterhouse Steak Flavour-Wet Food. Need I say more. Since my dog can't speak, I took that as an answer that she enjoyed the Cesar Wet Food much better. She wouldn't even eat the other brand. I already purchased more of the Cesar Wet Food. Another 'must try' product. Rated 3 out of 5 by ADAMCON_3581287590 from My dog loved this! My little PomChi licked it clean and wanted more when she was done. The size was perfect for her. It's hard to write an honest review for this when we only had one small sample to try, we have no idea how it affected her digestive system. Rated 5 out of 5 by AMYSON_3581184475 from My dog Chewy absolutely loved this! He's always loved Cesar as is so it's hard to tell if he liked the flavour more, but he was definitely pleased. He felt great after eating it and kept looking around for more containers! Rated 2 out of 5 by SANDYRON_3581278901 from The ingredient listing was concerning. After reading the label, it shows that the ingredients incorporated were not necessarily of good quality. Rather lots of chemicals and unknown meat sources. Rated 4 out of 5 by NICOLEHMB_3581270601 from My dog had never tried wet food before so I didn't know what to think but she gobbled it up. It smelt just as the package stated the flavour was. Rated 4 out of 5 by PATRICIA_CNB_3581184578 from My dog just loved it! Licked every last tidbit off the bowl. It seemed to have a good texture and is a very convenient size for smaller dogs. CESAR® Entrées Porterhouse Steak Flavour Food For Small Dogs is formulated to meet the nutritional levels established by the AAFCO Dog Food Nutrient Profiles for maintenance.